North DeKalb Mall, perimeter highlighted in yellow. After years of speculation, the redevelopment of North DeKalb Mall is gathering speed. The DeKalb Cross-Neighborhoods Council (representing residential communities in the vicinity) has met with the developer once, and strongly encourages residents in all surrounding areas to attend a community rezoning meeting, to take place on April 26 (see details below). The developer will reveal their current plan, and attendees will have a chance to ask questions, voice concerns, and later follow up with our Commissioners to provide feedback on the proposed plan. The DeKalb Cross-Neighborhoods Council welcomes feedback at crossneighborhoodscommittee@gmail.com. As reported by Decaturish and TomorrowsNewsToday, this will be a significant redevelopment; the scope is such that the Atlanta Regional Commission must provide a local impact assessment before plans can be finalized. 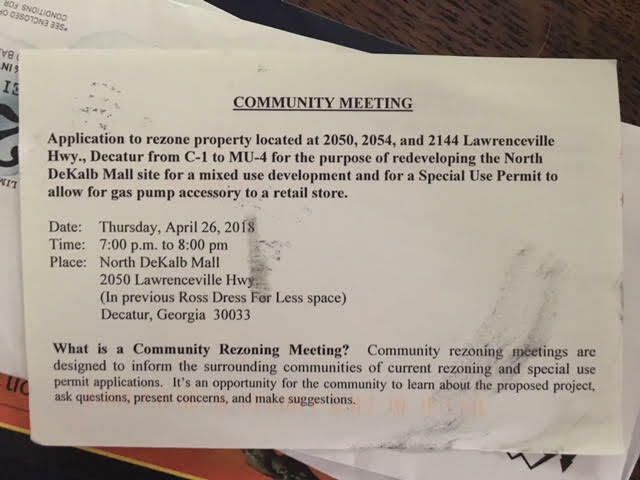 Because the proposal seeks to convert the property from commercial to multiple use (it proposes multi-family homes) and requests a gas pump (presumably for Costco), the developer must secure a Special Land Use Permit. Community meeting announcement for April 26, 2018, as distributed to some neighbors. Please share this information with friends and neighbors.